Photographs of the Eiffel Tower make great wall decorations for dorms. The Eiffel Tower is gorgeous and adds some pretty scenic views to dorm room decor. After all, the view you're stuck with outside of your college dorm room may not be the one that you want so your college wall decor may need some extra work. Adding scenic college posters near your college dorm room window is a great option so whenever you feel the need to look at your dorm window for inspiration you can look at some pretty dorm room decorations instead! Our Paris Kiss College Poster is a beautiful college poster that will add to your dorm room decor and also make your dorm room decorations unique! Our Paris Kiss Poster for dorm rooms features a unique photograph of the Eiffel Tower. The Eiffel Tower in this dorm essentials item is off center to the left of the college poster. In this college supplies item, a couple is kissing in the foreground next to a classic car. One of the stunning features of this dorm necessities item is the grayscale feature of this photograph. 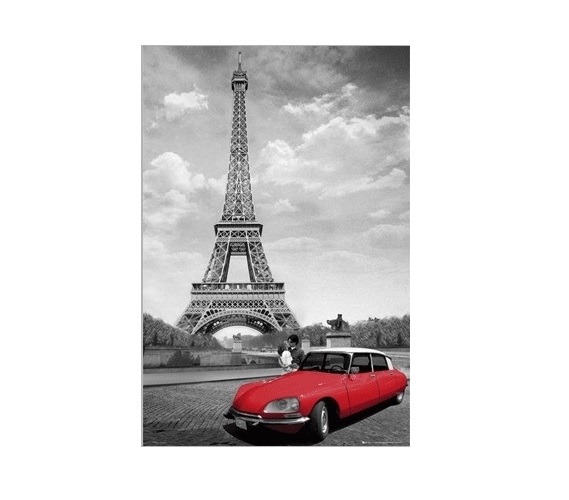 The backdrop is in grayscale while the classic car adds a pop of red color to your college wall decor. Your other dorm essentials will pop against the neutral tones in this cool poster for dorm rooms, making your dorm room decor the best on campus.